Nice Insight has learned from its strategic partnering surveys that the long-term strategies of many businesses in the pharmaceutical industry for maintaining a strong drug development pipeline include integration of biopharmaceuticals. This integration can take several different forms, from partnerships with large biopharmas (56 percent), purchase of a small biopharma company (51 percent) partnering with a small biopharma (37 percent) or simply purchasing a biopharma’s compounds (22 percent). This activity is motivated by the demonstrated profitability of biopharmaceuticals. The practice of partnering with, or acquiring biopharmaceutical companies is mirrored in the results of Nice Insight’s annual survey each year, where the percentage of respondents whose business is engaged in the development of biologic based therapeutics continues to increase — up two percentage points from 71 percent in 2012 to 73 percent in 2014. Spend on biologics development now consumes a slightly larger portion of these businesses annual expenditure as well: 57 percent in 2014 as compared to 54 percent in 2012. This practice continues to show promise for contract service providers in terms of both winning outsourced biomanufacturing projects and for manufacturing biosimilars/bioequivalents for the biologics that come off patent in the coming decade. Now is a good time to start considering CMOs for these projects. 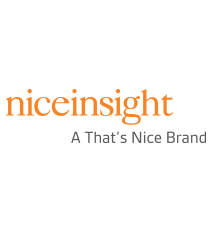 Interest in identifying quality suppliers for biomanufacturing services prompted the expansion of Nice Insight research to include specific questions about buyer’s habits when outsourcing mammalian and microbial manufacturing, as well as their supplier preferences. According to the 2014 study, 53% of respondents who will outsource biomanufacturing would engage a CMO for mammalian cell culture. In reviewing the companies that were most likely to be considered for this type of project, it was clear that overall excellence in customer perception played a strong role. In fact, these companies averaged excellent ratings (between 80 and 100 percent) from respondents who outsource mammalian cell culture in four out of five categories. Quality was the single category where scores fell slightly below the excellentrange (by 2 percentage points). The top companies considered for mammalian cell culture projects were: GSK Contract Manufacturing, Boehringer Ingelheim, CMC Biologics, Lonza and KBI Biopharma. Microbial manufacturing was reported to be outsourced with a greater frequency than mammalian cell culture, with nearly two-thirds of respondents who will outsource biomanufacturing reporting they would outsource microbial manufacturing (65 percent). Three of the companies that were most likely to be considered for mammalian cell culture also made the top 5 for microbial manufacturing: GSK Contract Manufacturing, Boehringer Ingelheim and Lonza. 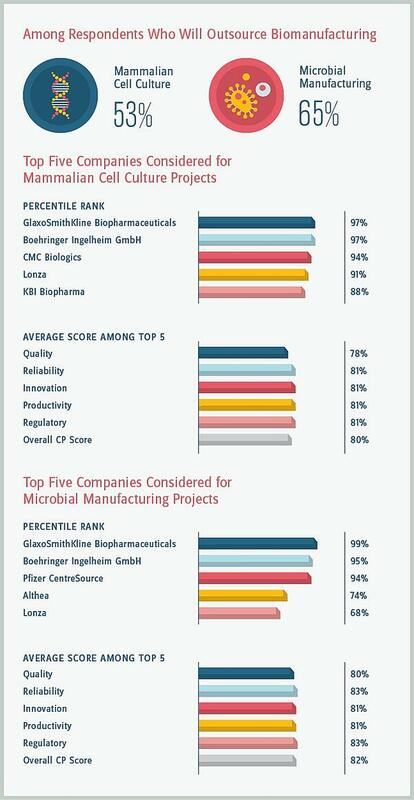 Pfizer CentreSource and Althea rounded out the top 5 companies most likely to be considered for a microbial manufacturing project. While the highest scores among the top five companies were in reliability and regulatory, these companies averaged excellentscores in all five categories. Nice Insight also reviewed the scores from broader group of CMOs for both mammalian cell culture and microbial manufacturing to see where these companies received their highest scores. The data showed that among mammalian cell culture CMOs, the companies received their best scores in Reliability and Regulatory. For microbial manufacturing CMOs, the best scores across the group were in Reliability and Innovation. It will be interesting to see from future research CMO increases the chances of being considered for a project when improving on these outsourcing measures. The percentage of new drugs to market that are biologic based continues to rise — from 26 percent of new approvals in 2011 to 29 percent in 2013 — which means it’s a good time to identify prospective outsourcing partners and begin to develop relationships. Consideration of the companies mentioned above is a good start, but this may end up costing more than joining forces with a smaller, lesser-known CMO. In which case, outsourcers of mammalian cell culture can start by looking for contract manufacturers with strong reliability and regulatory scores. Those looking to engage a CMO for microbial manufacturing should look for companies with strong reliability and innovation scores, as the companies that are most frequently considered for project performed strongest in these categories.